The perfect crab cake, in some circles, is a topic as hotly debated as global warming. I feel robbed, close to tears, when dining out and ordering a crab cake which turns out to be a bread cake. Embarrassing Richard, I’ve learned to quiz the waiter as to the ratio of filler to crab before ordering. With crab cakes, you get what you pay for and a crab-packed cake, cooked with fresh jumbo lump crab and a minimalist’s deft hand, comes at a price. Feeling festive and flush? Select this Rolls Royce of the crab world–sweetly tender and delicious, exquisite jumbo lump crab meat is surely one of life’s great pleasures. 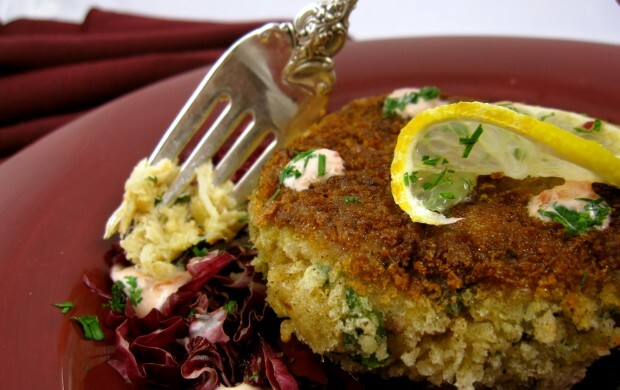 When making jumbo lump crab cakes at home, skip the bread crumbs and bind the crab with a beaten egg and flour. A pinch of Old Bay Seasoning would be a nice touch. Belt-tightening in order? Crab cakes can be deliciously proletarian, sensitive to your purse while pleasing your palate. I often make savory, budget-friendly crab cakes from canned claw meat found in the refrigerated sections of many local groceries. Crab claw meat is the “dark meat” of the crab and stands up to the bolder, Asian seasonings in this recipe. I give them a crispy panko crust and watch them vanish like proverbial hot cakes. 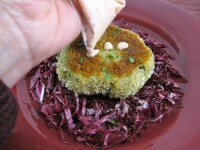 Whatever crab meat you select for your cakes, you must refrigerate your crab cakes at least 2 hours prior to cooking. If you ignore this important step, your crab cakes may fall apart, yielding crab crumbles. I’ve made smaller versions of these cakes and served them as appetizers. They require a bit more fuss but are great party food, especially yummy paired with a good Sauvignon Blanc or Riesling. *Available at most groceries in town; Asian grocers providing the largest selection. Combine 1 1/4 cup panko, scallions, cilantro, 1 tablespoon lime juice, 1 tablespoon soy sauce, 1 teaspoon chili sauce, 1 teaspoon ginger and crabmeat in a large bowl. Add additional lime juice, soy sauce, chili paste and ginger to taste. Add one beaten egg. Thoroughly combine and chill for at least two hours and up to 8 hours. Preheat oven to 200 degrees. Divide mixture into 8 patties. 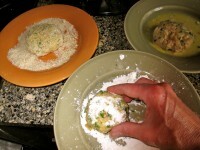 Place flour, remaining egg, beaten, and remaining panko in 3 separate shallow dishes. Coat 1 cake with flour, tapping off excess, then egg, letting excess drip off, and then panko, pressing cake into flakes to adhere. Transfer to wax or parchment paper. Repeat process with remaining cakes. Heat 3 tablespoons oil in a large heavy sauté pan over medium heat, and sauté cakes until golden brown on each side, about 3 minutes per side (155 degrees when temped). Turn cakes over with a guiding hand and spatula, adding additional oil to pan as needed. 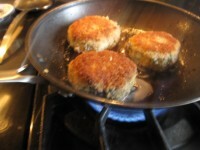 Transfer with a slotted spatula to a paper-towel-lined baking pan and keep crab cakes warm in oven until ready to serve. If making the sauce, combine 1/2 teaspoon red chili paste with mayonnaise, adding more chili paste to taste. Dot crab cakes with chili-mayonnaise or serve on the side as a dipping sauce.